What does your customer think about your brand? Ask yourself these 5 questions and find out. Have you ever wished you could stand in your customer’s shoes and know what they’re thinking when they land on your site? Me too! What is it that makes them stay, and what makes them turn off and click away? Fortunately, with a good checklist and a bit of smart thinking, you can make some fairly accurate guesstimates. 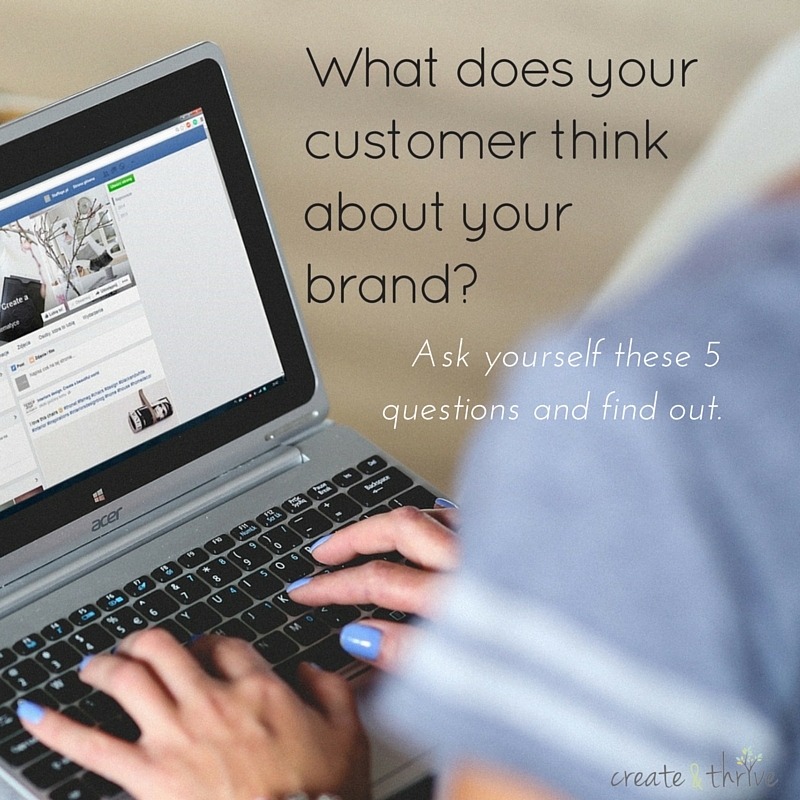 I’ve got 5 questions for you to ask yourself today in order to get clear on what your customers think of your brand and business. 1. Ask yourself, who is your customer? Is this a totally obvious question? It totally should be! And unfortunately, many businesses only think they’ve answered this question. Sadly, I’ve come across lots of small businesses who’ve only got a super vague idea of who their customer actually is. But knowing this is the essence of having a business, surely!? If you don’t have customers, you don’t have a business. The more you understand specifically who your customer is and what’s in their head, the better you’re able to communicate with them and give them the exact product they’re looking for. Your customer can be a lot like you, but they’re not usually you. Perhaps they’re you from a year or two back, perhaps they’ve got more disposable income than you, maybe their work situation is different to you so that they have more time to themselves. Focus hard on what makes them tick and get beyond the demographics – demographics are important to be sure, but you need to dig down deep into your ideal customer’s head. What hobbies and interests do they have? Do they have a similar world view to you? What motivates them? What are they currently worrying about? What makes them swoon? The more specific you are the better – use your knowledge of what they like to appeal to them. Whatever you do, do it with your beautiful, ideal customer firmly in the front of your mind. Seriously, the worst thing you can do for your biz is to try and be a generalist – to try and appeal to everyone. You KNOW you can’t, so don’t even try. 2. Does your site look neat and orderly? Right, let’s get down to the nitty gritty. When people land on your site, they take SECONDS to decide whether you’re right for them, based purely on how you present yourself visually. There are a whole bunch of things that contribute to this, so let’s go through them one at a time. Colour – Do you have a distinct colour palette that you use for all your graphics? A limited palette of 1 – 6 colours (not including black and white) is great for making your visuals hang together. Not only are you sure that every time you make a new graphic that the colours work well together, but you save a bunch of time because you’re not scrabbling around in the colour charts, trying to find a workable combination. When it’s done well, colour can be one of the most important identifying factors when it comes to business branding (think Cadbury – think purple). Fonts – Same goes for fonts – having a basic ‘wardrobe’ of no more than two fonts (OK, maybe three at a super-stretch) helps keep your text looking clean and orderly, and you save time because you’re not always choosing things afresh. More than three fonts starts looking very messy style-wise, but if you need to add variety, consider simply changing your font size, using bold and italics, or even changing the colour of the text (and any combination of these). Image style – Think about the business personality you want to project. Is it slick and high tech? Down-to-earth and friendly? Childlike and fun? Whatever you choose, make sure your images match that personality. Generally, don’t try and mix impersonal stock photos on your site with casual snaps you’ve taken yourself – the style difference is glaringly obvious and looks unprofessional. Tie all your images together by mood and/or styling. Alignment – This is the super-power of graphic design. Nothing looks messier than elements that aren’t all aligned – whether you choose centred, left- or right-justified, make sure the edges are all in a straight line!! Same goes for borders that don’t line up, or using lots of different sized things. I know it’s not always possible with everything, but if you’ve got a bunch of photos for instance, crop them all to the same size and put ’em in some kind of orderly grid. 3. How well can you solve their problem for them? So, now you’ve got their attention, you have to deliver the goods. There has to be some substance behind the gloss or they’ll give up and go elsewhere. It’s here where you let them know that you understand exactly what their problem is, and that you’ve got the perfect solution. Because customers have a problem to solve: that’s why they’re buying something – and their problem’s usually quite specific. Perhaps they need new earrings to go with their wedding dress, or a small waterproof toiletries bag to take camping with them, or a casual wrap to keep their shoulders warm while they do the weekly shopping. When you customer comes to your handmade soap shop, what are they looking for? Something beautiful and luxurious to give as a thank you gift to their bestie? Or something super mild and allergy free for their sensitive skin? There’s a story for every product that connects you to your customer – tell it. 4. Is it obvious what you want people to do? And how easy is it for people to ask you questions if they need to before they purchase? The totally awesome Seth Godin once wrote about the problems he experienced in trying to navigate a particularly difficult-to-navigate website. His message, as always, was spot on. Whenever you set up a site, however you lay things out, always make sure that it’s obvious what you want your audience to do next. They don’t know your site, they’ve not visited you ever before. And they don’t know you! So, put your menu in an obvious spot. 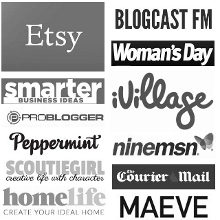 Make your “Buy” buttons stand out (use contrast – it’s really that simple); put the link to your mailing list near the top of your sidebar; make your contact forms and your email addy easy to find. 5. How can they trust you? Lastly, people need to trust you before they buy – and this is especially true of online transactions. People hesitate if the thing they want to buy has risk attached to it – “what happens if it doesn’t fit when I get it?” or “I’m not sure if that colour will look OK on me”, or even “I’m not sure if your coaching packaging is right for me and my biz”. How do you build trust? Through social proof. This is simply other people who are unconnected with the business, recommending you – word of mouth is the best advertising you can possibly get (and you get them by delivering top quality product with top quality service, paying attention to every aspect of the customer’s experience). Collect testimonials and put them up on your site. What if you’re just starting and you don’t have testimonials? Your About page is the perfect place to start to building a connection between you and your customer – did you know it’s the second most-visited type of page on any site (next to the home page)? Tell your customers the story of why you do what you do – how you started and what it means for you. Make it personal, because people love connecting with people. Offering guarantees is yet another way to inspire trust in prospective customers – 30 day money-back, exchanges, or extra bonuses are all ways to help lessen the perceived risk for customers. So, take a step back from your site, and pretend that you’re encountering it for the first time. Go through each of the 5 questions in turn and adjust your site accordingly, and you’ll be sure to end up with a site you customers will thank you for. Now, I’d love to know – What are some of the worst, and the best sites you’ve visited, and why? Your answers here will help everybody make their sites lovelier, so fire away!